I co-hosted a small gathering at my place to watch the proceedings on IFMud. 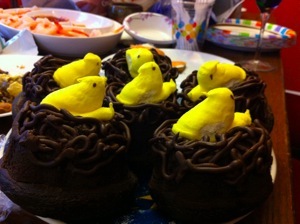 The vaguely thematic snacks we presented were all handily superceded by Ruth’s gift of The Warbler’s Nest cakes. The homemade chocolate buttercream mixed deliciously with the spongy atmospheric dread. As for the actual XYZZYs, Matt Wigdahl’s dinosaur-infused young-adult adventure Aotearoa ran away with it, racking up seven awards, including Best Game. Of Gameshelf writers’ nominations, Zarf’s Hoist Sail for the Heliopause and Home took home Best Writing, and he also nabbed Best Technological Development for Quixe. And I humbly report that my own Warbler’s Nest won the Best Story XYZZY. I was a little sad that the ballot didn’t contain more nominees from outside the IFComp, particularly since 2010 saw many fine IF games released for Jay is Games’ Casual Gameplay Design Competition #7 at the start of the year. I suspect a recency effect; since the high-profile and heavily discussed IFComp happens late in the year, its titles are quite fresh in the minds of folks casting first-round ballots. I can speak for myself, here: only after I saw Stephen Granade’s excellent Fragile Shells on the final ballot did I realize that I hadn’t even considered it when submitting my own nominations, even though I loved it, way back in the mist-enshrouded days of last January. I was interested to hear followup discussion, both at the party and on the MUD, about ways the XYZZY nomination ballot might present the year’s works other than the monolithic alphabetically sorted list it sports now. Perhaps double-sorting the list by competition (including “non-competition” as a category), and then by date, oldest-first? But, that’s a matter for next year. Voting in the 2010 XYZZY Awards — the Oscars of interactive fiction! — closes this evening (Friday, Feb. 25), at midnight Pacific time. The awards ceremony will happen precisely twelve hours later on IFMud. Anyone can vote, via the web interface. The contest organizers assure me that submitting partial ballots is A-OK, so even if you’ve (played/read/used) only a fraction of the (games/books/resources) up for awards, I encourage you to vote just the same, sticking to the categories you’re comfortable with. My pal Joe points us at this entry in Chronogamer, regarding the 1980 Atari VCS port of Space Invaders. It caught Joe’s eye because of its explanation in the comments (by “supercat”) of the game’s “double-shot” exploit — a very early example of an undocumented game-console cheat, and a possible side-effect of Space Invaders’ pioneering two-player co-op mode. This post also serves as my discovery of Chronogamer. This weblog documents the quest of atariage.com user “Mezrabad” to play every single home console game commercially released in the United States, in chronological order, starting in 1972 with the Odyssey. The blog appears to have entered hiatus in 2010, but only after five years of writing and eight years’ worth of retrospective, so that’s quite a lot of cartridge-cobbled ground covered. Chronogamer’s writing style can get rather breezy at times, but if that helps the author keep pushing through the games, I approve. I’m very happy someone is doing this, really, since it reminds me of the original concept behind Jmac’s Arcade, before that ended up sailing off its own thematic direction. It’s not impossible that I’ll return to Arcade with a more general goal of historical documentation, rather than personal memoirs (a much shallower well). But if some other halfway decent writer wanted to pick up that flag for coin-operated arcade games in the meantime, I’d applaud it. Tags: atari vcs, digital games, links, nostalgia. Continue reading IF at PAX East 2011 -- compleat schedule. Tags: boston, if, pax, pr-if. IF to welcome our new robot masters? A cogent response by Stephen Granade to the question of whether the victory of the Jeopardy!-dominating computer suggests that modern interactive fiction should move to adopt more heavy-duty natural-language processing in its player interface. Even if you had a perfect parser that could understand everything you typed, the game has to know what to do with it. Parsing is no good if you don’t do something with the results. Watson’s processing power let it parse text input and, based on that and its knowledge of how Jeopardy! answers are structured, make inferences about what related question fit the input. How much power would a game need to respond appropriately to sentences like ‘What have I been doing?’ or ‘Measure out my life in coffee spoons’? Take the case of an IF parser that accepted adverbs. Current IF parsers accept commands that are of the form VERB THE ADJECTIVE NOUN, occasionally with an added preposition and second noun: ‘PUT THE BOX ON THE TABLE’, ‘OPEN THE RED DOOR’, and similar. Now add in adverbs, so that you can ‘OPEN THE RED DOOR SLOWLY’ or ‘PUT THE COFFEE CUP DOWN QUICKLY’. Now the game must decide the difference between putting something down quickly or slowly. What does it mean in game terms to TURN THE KNOB ANGRILY? You’ve added more nuance to a player’s interaction with the game world, and the IF author has to handle that nuance. It’s more work for the IF author; does it add enough to the game to be worth that work? And in case you missed it last week, you should read Ken Jennings' entertaining and insightful observations on being one of the soft and fleshy humans that Watson coldly obliterated on national TV, a mere demonstration of our new computer overlords' powers. Tags: game shows, if, interactive fiction, links. My apologies for the spamming this blog may have wrought on your feed reader (twice over, if you're subscribed to the comments feed as well). The new templates had a different idea of entries' unique ID strings than the previous ones did, probably confusing most RSS readers into displaying duplicate Gameshelf entries. I've now reset the IDs to their old patterns, and so that should be that. Related: I purposefully chose to not import the old video-only RSS feed to this new blog. That was an artifact from back when I still considered the Gameshelf to be a video series with a supplementary blog, but all that changed last year. Little is lost: you can quite easily access all the videos we've published by visiting the Gameshelf TV category. 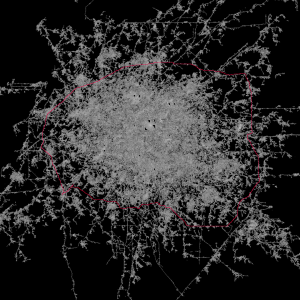 Included in his report is this crazy image he made (via Python script) out of his own Wordsquared empire, which looks something like a satellite image of Mexico City if it were made out of scrabble. Click to see DevJoe's full-sized image, keeping in mind that one pixel equals one letter-tile a 14-by-14 square of tiles! While the game uses a very simple ruleset, turnless and with minimal player interaction, it still manages to feel like a multiplayer competition over limited resources -- even though the board seems effectively boundless. The first word you lay down must branch off another player's tile, Scrabble-style; but thereafter, you can only build off your own words. Other players' tiles become obstacles to build around. They are prone to appear in your path as your opponents make their own moves, like very slow and lexicographically driven Light Cycles. If you get boxed in to the extent that you can't make a legal play with your racked tiles, you can swap them out at the cost of one "life". Lose all your lives and your game ends; you must start again, from zero points. Devjoe's avoiding such shocking permadeath for so long brings to mind carefully cultivated weeks-long Angband campaigns from my own gaming history. I don't know how this challenge pans out over long-term play -- whether, for example, it ever becomes truly difficult to break away from a multi-player gridlock with a fresh new letter-isthmus to branch freely from. But regardless, Wordsquared seems an intriguing take on the browser-based multiplayer game with a limited but carefully defined sense of inter-player interfacing. Tags: links, web games, word games. This evening I switched The Gameshelf’s blog software from Movable Type to Melody. I also took the opportunity to finally roll out an entirely new site theme (a customized version of TwentyTen), something I’ve been meaning to do for months. The sidebar’s blogrolls and links and such have all vanished, but they’ll bubble back presently. The old site had grown a lot of cruft that doesn’t really apply the to the blog anymore, and I decided to just scrape it all off and then re-apply the good stuff. System-wide changes like this always carry a raft of hidden bugs. If you run into anything that looks or acts flat-out wrong, leave a comment here or shoot me an email. Thanks! Continue reading The Secrets Game (idea). Tags: casual rpgs, echo bazaar, game design, secrets, text generation. Continue reading Desktop Dungeons and tiny UI hangnails. 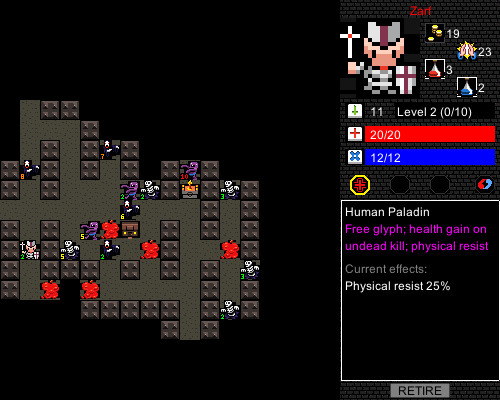 Tags: design, desktop dungeons, microroguelikes, roguelikes, ui. Continue reading So what does a month look like?. Tags: curveship, hadean lands, if, interactive fiction, xyzzy awards, zarf. Continue reading Jane McGonigal talk: "Reality is Broken". Tags: args, jane mcgonigal, serious games, social games.